Watch the folks "Get into it"! 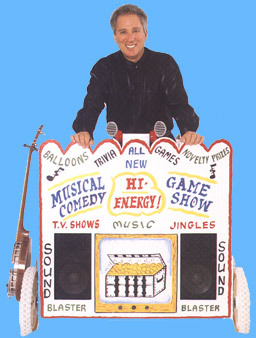 For Fairway or Stage, All new Fair Attraction -- High Energy walkaround musical comedy game show plus banjo music. The newest entertainment to hit the fair scene has everything in one package--like one-stop shopping! It features for the first tine a roving musical game show with hilarious comedy, party games, trivia, funky prizes and balloon hats. This walkaround podium can be used anywhere in the fair. The high-energy musical comedy game show features contestants on both sides of the podium who press buttons (with different horn sounds) as they name the TV show or guess the ad from the music. The younger contestants work in teams as they run to adults who help with the answers when the show is unknown. All of the contestants receive genuine-imitation mardi-gras beads and of course balloon hats. Emceeing this hilarity is Richard Pearl, an entertainer who regularly performs with the likes of Regis Philbin and Rich Little and whose comedic sense has everyone in stitches. To attract people to the game show, Rich plays phenomenal banjo featuring country, dixieland and classical music. The Game Show touches everyone's lives and gives then a good time. The music is performed by a virtuoso, the Musical Comedy Game Show has sharpened everyone's wit, the prizes are amusing and the Pearl comedic touch has everyone holding their sides.